Mr. Gautam Chowdhary, Managing Director has proved to be an able successor to his illustrious father. The foray of Sanstar into manufacturing of starches and sweeteners and its emergence as pioneers in the corn wet milling industry was under his dynamic leadership and enterprise. He looks after the strategic affairs of the company. His vision and leadership are main drivers for the success and growth of the company. Sambhav Chowdhary, completed his B.E. Chemical from Nirma Engineering College, Gandhinagar. He has pursued his MBA module from Imperial School of Business, London, United Kingdom. 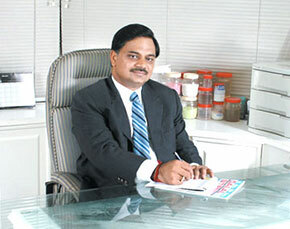 He has experience of working at the Infosys then posted to London on contract basis for one year on assignmet of British Telecom , London and joined the family business in 2009 and now looking after the complete operations , expansion , management of Sanstar Bio-Polymers Ltd. .
Shreyans Chowdhary, completed his B.E. Chemical from L.D. Engineering College, Ahmedabad. He has pursued his Msc Management module from Cass Business School, London, United Kingdom. and joined the family business in 2010 and now looking after commercial aspects.